Here are some handy quick commands that can be typed into the start search box or command prompt in Vista/Win7 and WS2008. Video demonstration of creating and deleting recovery point with DPM 2007 via PowerShell. Handy to know if you have problems with your GUI console or just want to create scripts in order to get things done quicker. I had to restore my GRUB on a machine recently as Windows 7 completely overwrote it (how rude) and then site below had the best and easiest method to get it back up and running. Be careful as this is for Grub2 or later versions of Ubuntu. If you are starting out with a clean sheet, install Windows first then Ubuntu or use a boot loader such as BootIT. Recently had an issue when RDP into a workstation and then launching Citrix from that RDP session where by the U key was causing all sorts of dramas. 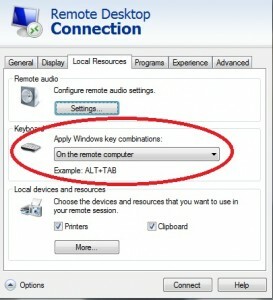 The problem turned out to be Hotkey functionality and the fix was simple, change the Windows Key Combinations to”On the Remote Computer” as seen below. References for issues with updates on ESXi4 update 1. This is a very cool and handy site that will generate Debian and Ubuntu Sources list for packages with apt or aptitude. I don’t need IPv6 on my internal servers and workstations, however now all distro’s seem to be shipping with IPv6 enabled by default. To disable follow these steps and see the reference sites for more info. Now comment out all IPv6 references in /etc/hosts and restart server. If you need to stress test your Linux box there are some great tools available. For Debian/Ubuntu use the repositories for a simple solution, it’s call stress.